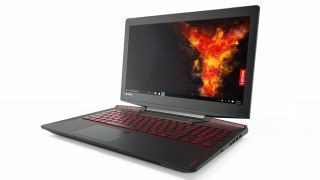 Lenovo has revealed a new range of Legion gaming laptops at CES, with the initial offerings being a pair of notebooks aimed at mainstream and enthusiast gamers respectively. Both Legion laptops are 15.6-inch models and have Kaby Lake processors with up to 16GB of DDR4 system memory (in two sticks), and they offer optional keyboard lighting – full RGB on the Legion Y720, and simple red backlighting on the lesser-specced (and cheaper) Legion Y520. The top-end Y720 is a VR-ready notebook powered by a choice of either Core i5-7300HQ or Core i7-7700HQ processors, with GeForce GTX 1060 graphics on board (along with 6GB of GDDR5 memory). The IPS display is a Full HD affair, or for those who want a bit more, there’s an optional 4K anti-glare screen. Storage options comprise of a 128GB, 256GB or 512GB PCIe SSD, or a 500GB up to a 2TB SATA spinning disk. Dolby Atmos sound is on board, which Lenovo notes is a first for a Windows PC, allowing for pinpoint three-dimensional sound through your gaming headphones, and offering a tactical advantage in terms of knowing your enemy’s location merely from the noises they’re making. The Y720 also comes with built-in Xbox One wireless controller support, and optimized cooling with dual metal fans and rear air vents to ensure that the processor and GPU don’t get too hot. Battery life is rated at up to 5 hours. Moving on to the Legion Y520, this model offers up to Core i7 (Kaby Lake) CPUs, and up to the GeForce GTX 1050 Ti in terms of a graphics solution. There is no 4K screen option here, or Dolby Atmos sound – but you do get a pair of 2W Harman Kardon speakers with Dolby Audio Premium. Storage options, however, are the same as the other model. Battery life is a claimed up to 4 hours, and this is a slightly more portable machine at 26mm thick and weighing 2.4kg (compared to 29mm and 3.2kg for its bigger sibling). The Legion Y520 will be first out of the gates and onto the shelves, arriving next month and starting at $900 (around £735, AU$1,255), with the Y720 following in April and starting at $1,400 (around £1,140, AU$1,950).